The times determined for the celebration of the Lord’s Supper (Communion) were between Easter and Pentecost in springtime and after the harvest in autumn. The Lord’s Supper was supposed to always be celebrated in the church building. For this reason, in springtime worship services with the Lord’s Supper began when the congregation had moved into the church for worship services again and in autumn they were held before moving to the schoolhouse for the cold part of the year. Typically, the Volga colonists received the Lord’s Supper twice a year. Given that the number of communicants had significantly increased in large parishes, such as Norka, it was reported by Pastor Seib that the worship service could last from 9:00 a.m. in the morning to 2:00 or 3:00 p.m. in the afternoon to accommodate all who wanted to partake. Church registers were kept of all family members taking part in Communion from at least 1834 to 1905. 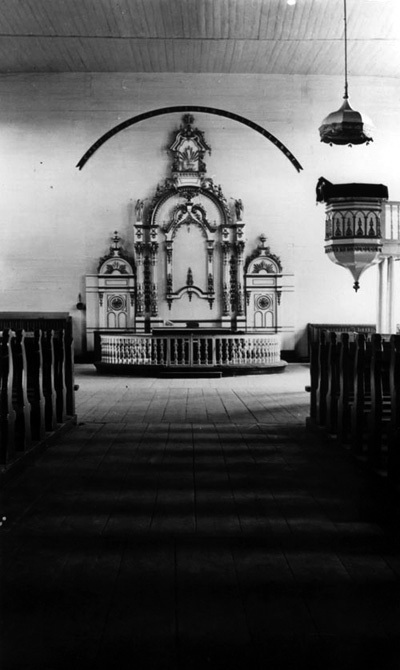 Interior of the Norka Church in 1912 with the altar and Communion Table in front and the side pulpit to the right. Photograph used with permission of AHSGR.